Designer of the week: Björn Björnsson! Björn Björnsson, an Icelandic born and raised, studied at Copenhagen’s Fredriks-berg Technical School of Interior Architects where he received his Masters degree in Architecture/interior design. After about 30 years of experience in the field with designs all over the world, Björn is considered one of Scandinavia’s and United State’s most renowned and successful interior designers. Björn’s work has been published in many distinguished architectural publications such as Architecture of Denmark, The Icelandic House Beautiful and The New York Times. Björn is a member of the ASID as well as AIA and has worked with multiple charities such as Kips Bay, Holiday House and The Altos de Chavon School in the Dominican Republic. Björn has distinguished himself as an elegant and sophisticated designer who responds to his client’s needs to create a home in which the client can call his own. Björn enjoys working in a range of styles including contemporary, traditional, modern and/or transitional. Designer of the week: Skrautmen! 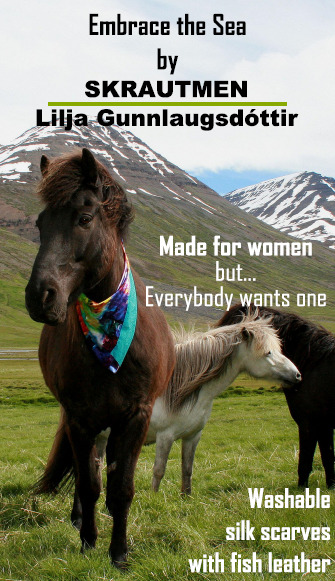 Skrautmen is a small innovative business located in the small town of Sauðárkrókur in the northwest part of Iceland. The designer behind the name is Lilja Gunnlaugsdóttir, a data analyst with a creative mind! The concept started with Lilja playing around and giving life to her acrylic glass handcraft through laser cut teqhnique, using it to decorate her home and for gifts to friends and relatives but soon she started selling it. The concept quickly escalated after that into something much bigger, and in 2013 the data analyst quit her job and started her own company "Skrautmen". The crown jewel of Skrautmen is “Embrace of the sea”, scarves combined of silk and washable salmon leather. Lilja is fascinated by contrasts that make a whole when put together. The raw roughness of the leather combined with the delicate nature of the silk create a very feminine whole! Lilja also designs jewelry and within her collection can be found a gorgeous creation called “þoka” (fog) – necklace made of wooden beads and salmon leather. It's giveaway time on social media! We are feeling generous here at Atlantic Leather and therefor we decided to kick off some social media madness! On daily basis we are very active on Facebook, Twitter and Instagram and to start the weekend, we decided that today would be social media giveaway day! We decided that nothing less than leather from all species of fish we offer would suffice so this package contains wolffishleather (green), codleather (red), salmonleather (yellow/golden) and perchleather (black), and last but not least we added a cognac colored lambskin to complete the package! If you want to participate in any of the giveaways, you can choose from any of the three social media below, or participate in all three- that of course triples your chance to win! Each link specifies what needs to be done to participate. And feel free to spread the gospel! Have fun, good luck and have a nice weekend! Designer of the week: Heidi & Adèle! The brand Heidi & Adèle consists of the two designers Heidi Carneau and Adèle Taylor. The brand was launched after over 20 years of friendship between the two designers, and the focus is on handbags and accessories made from eco-exotic leather. Their products are a gorgeous combination of Parisian elegance and flirty London exuberance, whilst focusing on simplicity through sustainable sources. Heidi and Adèle are both very passionate about eco-exotic leather and sustainability, and have travelled the world to connect with likeminded suppliers and manufacturers. Heidi & Adèle carry a collection within their brand called “The Atlantis collection” which consists of handbags and wallets made from Atlantic Leather's Salmon among other eco-exotic leather such as eel leather. The start of a weekly blog section called "designer of the week"
We want to start by thanking you all for the exceptionally good response to the new look of our website! With the new blog feature that was added to the website comes an awesome new possibility for us ----> A better chance to promote the designers using our product! October 2015 newsletter - Introducing MIMOSA! In our October newsletter, we introduce you to our new vegetable tanned salmon leather. We have chosen to call it MIMOSA! Paris taken by a storm! The exhibition "La Cuir de Paris" takes place September 15-16 and 17 and of course our crew is there. We are located in hall - 3, booth - C69 and will welcome you all with a piece of Icelandic chocolate, a smile and our newest color trend hot from our designing table!